On 21 June 2017 the long-awaited KDIGO guideline update on CKD-MBD was released. 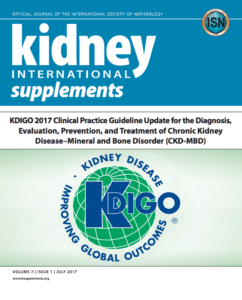 The KDIGO 2017 Clinical Practice Guideline Update for the diagnosis, evaluation, prevention, and treatment of CKD-MBD represents a selective update of the prior CKD-MBD Guideline published in 2009. Topic areas encompassing updated recommendations include: diagnosis of bone abnormalities in CKD–mineral and bone disorder (MBD), treatment of CKD-MBD by targeting phosphate lowering and calcium maintenance, treatment of abnormalities in parathyroid hormone in CKD-MBD, treatment of bone abnormalities by antiresorptives and other osteoporosis therapies, and evaluation and treatment of kidney transplant bone disease.